Lately (with the exception of vacation of course) I have been trying to eat a lighter meal in the evening. I find I sleep better and that if I balance what I am eating correctly, that the next morning when I WOD I have more energy and feel better. Since my garden is abundant is radishes, salad greens, strawberries and herbs right now I wanted to come up with something to go with simple grilled chicken breasts. 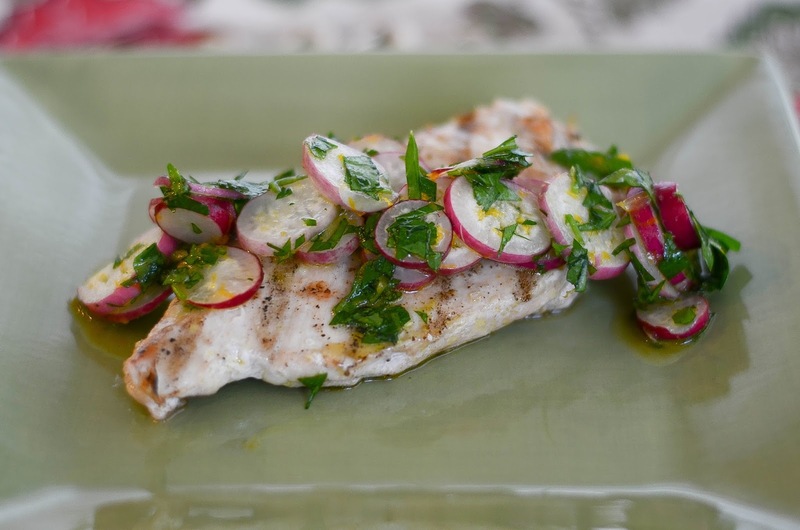 The hint of orange sweetened the peppery radish just right without being overbearing. Sometimes simple really is perfection. Preheat and prepare grill. Coat chicken breasts lightly with oil and generously salt and pepper. Place on grill and cook 12-18 minutes depending on thickness, turning one or twice. Meanwhile, mix radishes, parsley and zest in bowl. In a different small bowl, mix orange juice and oil oil, then salt and pepper to taste. Fold with radish mixture. When chicken is done, set aside for a few minutes (allowing juice in chicken to set) and then top with radish salad.